Hmong Culture research papers discuss the ethnic group found in several Asian nations, originally believed to have come from the Yangtze River in China. The Hmong are an ethnic group found in several Asian nations, originally believed to have come from the Yangtze River in China. During the Ming and Qing dynasties, the Hmong rebelled against Chinese rule, and were forced to migrate southward, into Burma, Laos, Thailand, and Vietnam. The exact history is difficult to trace, since the Hmong are still a largely oral tradition culture. Hmong culture is based on the clan. There are about 18 Hmong clans in Laos and Thailand, for example. All of these clans are exogamous, meaning that one must marry outside of one’s clan. With Hmong weddings there are a number of strict rules that brides must follow. For example, when leaving her house, she may not look backwards for fear that she will miss her family. During a wedding feast, no dishes with peppers can be served, as peppers will make the bride and groom’s life bitter. Christian missionaries converted many Hmong in the 19th century, but many traditional aspects persist in their culture, including widespread use of herbal remedies. One of the biggest celebrations in Hmong culture is New Year, which traditionally was used to thank the spirits of ancestors. Hmong New Year is frequently marked by dancing, music, and bull fights, as well as traditional food and dress. 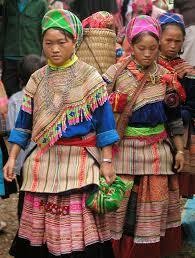 Black Hmong wear dark indigo clothing, while the Flower Hmong have more brightly colored traditional outfits. Hmongs and Mexicans Living in California Research Papers discuss the specific sources that are needed for the project, and the format in which the paper is to be set up. Women in Asian societies have long been the underclass and subjected to economic, social, and legal discrimination. Paper Masters writes custom research papers on Hmong Culture and discuss the ethnic group found in several Asian nations, originally believed to have come from the Yangtze River in China.